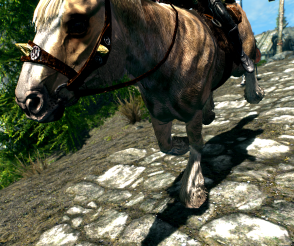 This mod improves the "hoovestep" sounds of the horses by adding "sound sets" for different surfaces. You're NOT allowed to use any of these sounds (modified or unmodified) in a commercial or uncommercial project. You're also not allowed to upload the mod or parts of it to any other site or reupload a modified version to nexus - no exceptions! Added version with reduced volume. Added tutorial to the frontpage. 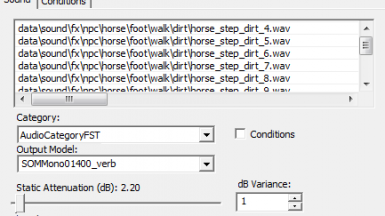 This mod improves the "hoovestep" sounds of horses by adding "sound sets" for different grounds. That means all horses will have different step sounds for surfaces like snow, dirt, stone etc. As usual, every sound is completely self made (recorded and edited). 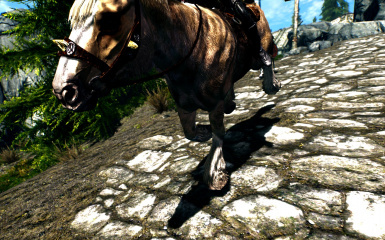 Should be compatible with every horse mod. 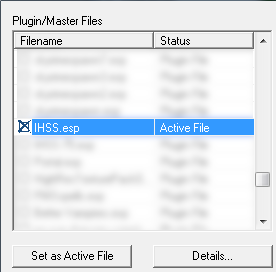 Select Audio->Sound Descriptor and enter horse in the Filter text box. changes immediately with the play button above the soundfile name box. When you're done, save and start skyrim. Check the credits and distribution permission page for corresponding informations. Since I've got various PM's: Theres really no way to convince me to get my permission to upload any of my mods to another site, sorry. All of my Skyrim mods are Nexus exclusive.